Seymour was cited by match commissioner Yves Thieffine after the incident in Sunday's Heineken Cup Pool Four tie. He pleaded not guilty to foul play at a disciplinary hearing in Dublin, but independent judicial officer Simon Thomas upheld the citing complaint. European Rugby Cup (ERC) issued a statement explaining the punishment handed to the 24-year-old. It said: "The judicial officer upheld the citing complaint and employing the IRB recommended sanctions for Law 10.4(j), he decided that the offence warranted a low-end entry point of four weeks. "However, when considering the very specific circumstances of the tackle, the judicial officer felt that a four-week suspension would be 'wholly disproportionate'. "Accordingly, and based on the presence of a number of mitigating factors, including Seymour's clean record, the judicial officer reduced the sanction to a one-week suspension." 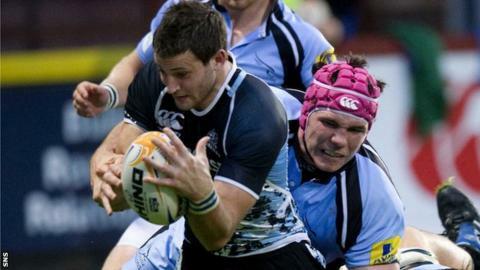 Meanwhile, former Scotland lock Nathan Hines has received a six-week ban for stamping on Scarlets wing Morgan Stoddart during a Heineken Cup game last Saturday. The Clermont Auvergne forward was cited by match commissioner John Cole and he pled not guilty to the offence when he, like Seymour, attended a hearing in Dublin on Thursday. Judicial officer Thomas upheld the citing complaint and found that Hines had "stamped on his opponent and had connected on more than one occasion". Thomas decided the offence warranted a mid-range entry point of a five-week suspension, but he added a week due to 35-year-old Hines' poor disciplinary record. He will miss Clermont's Heineken Cup trip to Exeter on Saturday, and cannot play again until 26 November, although he will be available for Clermont's Pool Five fixtures against holders Leinster in December. Hines won 77 Scotland caps before ending his international career last year. He also toured South Africa with the 2009 British and Irish Lions.